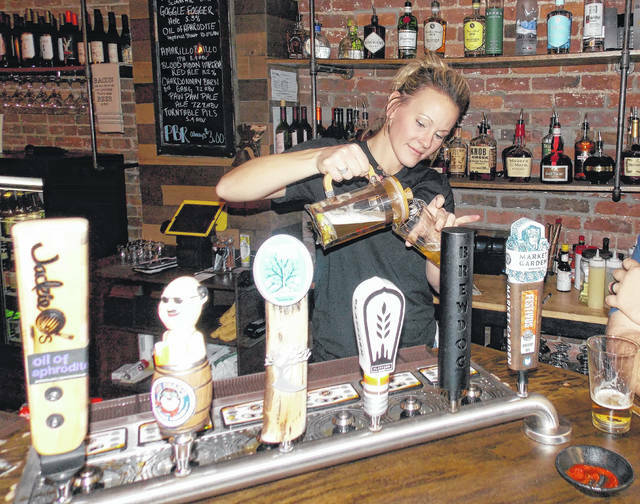 Delaware native Amanda Sykes, co-owner and bartender at The Flying Pig Ale House in downtown Delaware, pours a glass of beer from a french press that was used to infuse the beer with dry hops. Whether it’s taking a torch to a piece of wood in order to create a smoked old fashioned cocktail or advising customers to avoid the temptation to poke the pig, Delaware native Amanda Sykes is determined to make The Flying Pig Ale House a success by offering patrons a unique experience. While the ale house offers cocktails along with various food items, its biggest draw is its craft beer selection and the way in which it’s served up using the Bottoms Up Draft Beer Dispenser System. Sykes added that the draft system is a win-win because it’s designed to maximum profits and customers seem to be mesmerized by it. “It’s super efficient,” Sykes said. “There’s less waste; it’s faster; and there is less room for bartender or human error with spilling or overpouring. “It’s also a bit of a novelty because people see it happening and they order another beer just to see it again,” she added. In order for the unique draft system to work, a magnet featuring The Flying Pig Ale House logo seals the bottom of the glass after the beer is poured. Unfortunately, curiosity has gotten the best of many patrons who “poke the pig” on the logo, causing the magnet to come unsealed and beer to spill out of the bottom of the cup. “The nice thing is when they do that (poke the pig) … we ring a bell, announce across the restaurant who poked the pig, and then we ask them to kindly donate to our charity jar,” Sykes said. The Bottoms Up Draft Beer Dispenser System isn’t the only thing bringing excitement to the ale house. Having found her niche bartending, Sykes has some tricks up her sleeve when it comes to serving up alcohol in fun, engaging ways. “As far as our drinks go, people are having so much fun at the bar because we are doing some fun stuff,” she said. “(The alcohol) is not just there to drink. It’s there to play with. While Sykes enjoys running the business and serving up drinks, she also has a strong desire to create a spot in downtown Delaware where everyone feels welcome and part of a big, extended family. Since her family is fourth-generation Delawareans, Sykes is doing her best to not only give residents a place to hang out and enjoy a drink or homemade meal, but also a place where she can help other local businesses grow and prosper. “Everything in the kitchen is made from scratch, and we use a lot of ingredients from local businesses,” she said. For example, the ale house, which opened on Oct. 17, gets its oils from Olivina Taproom, its cheeses and meats from The Greater Gouda, and its bread from Fresh Start Cafe and Bakery. As for the food menu, true to the flying pig moniker, the ale house has its fair share of pork products from candied bacon and pork fingers appetizers to entrees like pulled pork and Cuban sandwiches. For patrons not interested in consuming pork, the ale house also offers classics like grilled cheese sandwiches, macaroni and cheese, a fish platter, and salads. The Flying Pig Ale House is open Monday through Thursday from 11 a.m. to 10 p.m., Friday and Saturday from 11 a.m. to 12 a.m., and Sunday from 11 a.m. to 9 p.m.
For more information and to view the menu, visit theflyingpigalehouse.com.